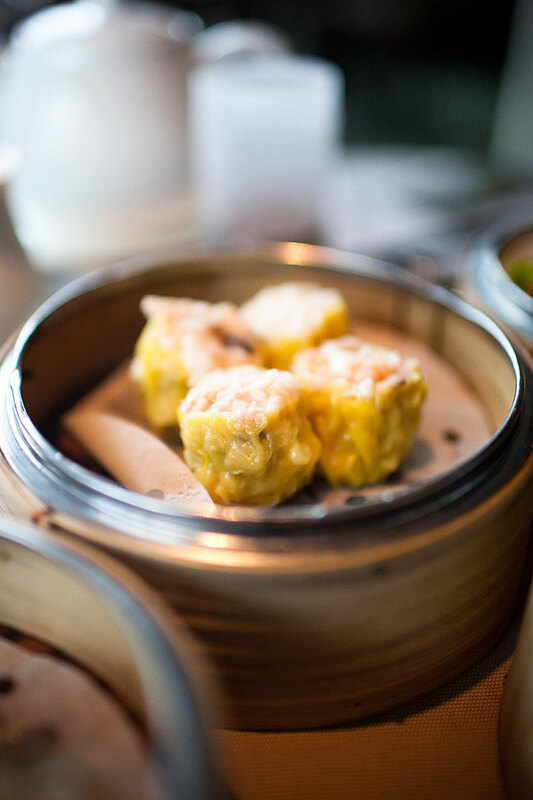 Some people love the dimsum in Hong Kong, while others are more inspired by Hong Kong's signature skyline. In Hainan No. 1 you have the best of both worlds. Located at high level of iSquare in Tsim Sha Tsui, you can enjoy your Chinese food while overlooking the beautiful harbour. This time we were lucky to try their special dimsum on the last day of the promotion period. The special dimsum included many of the old ones that you probably cannot find in today's Chinese restaurants. Besides some of the typical dimsum like steamed rice roll 腸粉, this place also has fusion dimsum. These funny looking buns below are Japanese wagyu beef buns 和牛包. Beijing Dumplings 京川餃子 is quite well done. I cannot take too much spicy things but this one is indeed a very good appetizer. 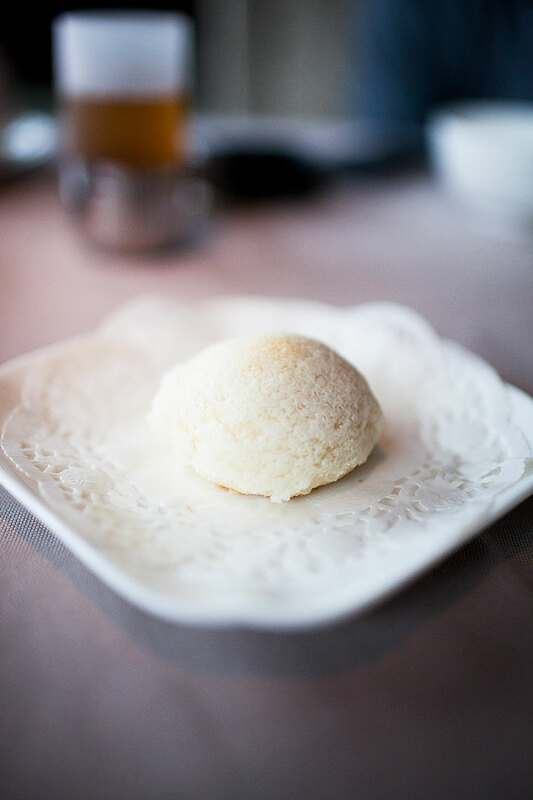 No one should miss the Crispy Roasted Pork Buns 雪山叉燒包. 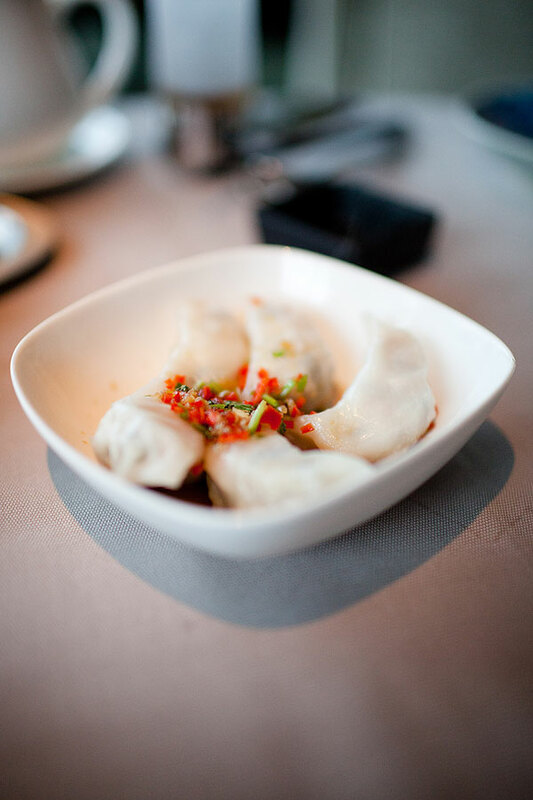 It is like a must for any yumcha session. 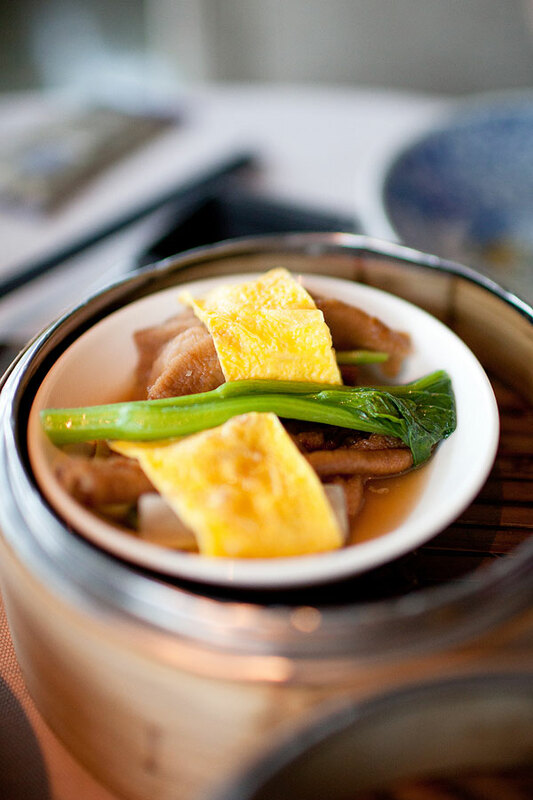 The first old dimsum was, umm, Duck Feet with Abalone and Chinese Yam Wrapped by Egg Slice. It is so hard to translate the names because the Chinese names are much more beautiful and poetic. 赤繩欣繫足, literally means Feet Tied by Red String. (red string is thought to be the connection between two lovers in Chinese culture). Yes, this is a name about relationship and love. Anyway who cares. The duck feet was deboned and marinated, and then wrapped with abalone and Chinese yam slices before being steamed. The combination of different mixtures is very interesting: the soft skin from the duck feet mixed with fabrics of yam together with the chewy abalone. This shows the chef's understanding of food material and also his creativity in cookery. The next one is 雞蓉乾蒸賣 Chicken Shumai topped with Crab Roe and Yolk. Typical shumai uses pork and shrimp as the filling, but this one uses the meat from chicken leg. 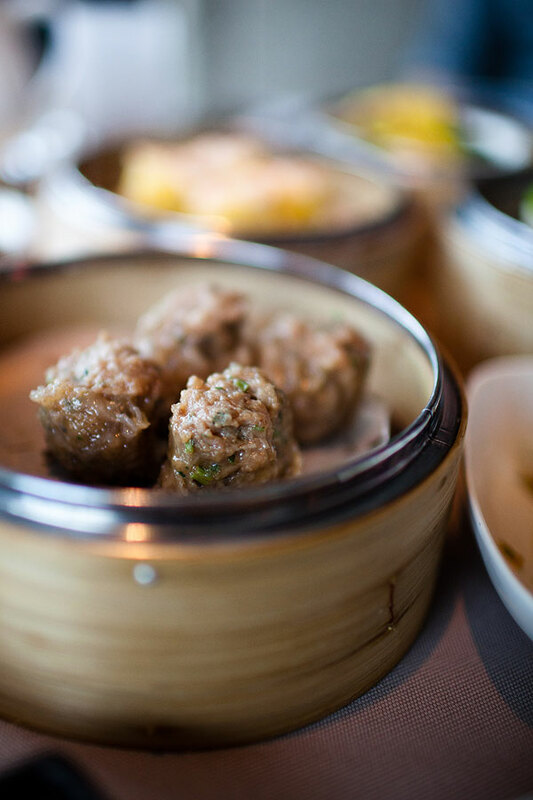 The outcome is a more tender filling, which probably means a healthier dimsum as it has less fat than pork shumai. Another awesome dimsum is this, Shrimp with Quail Egg (彩鳳隱龍懷 meaning a Pheonix having a Baby). The shrimp is pressed into shape with half of quail egg stuffed in the middle. It looks beautiful and the crispy shrimp tastes wonderful. The following one looks like beef shumai, but instead of using typical wrapper made with flour, this one uses leaf lard. Yes, it is 網油牛肉卷. Leaf lard is the lard around the muscle of a pig, which looks like a net. During the cook, it will bring out the flavour from the beef when it melts into the beef. 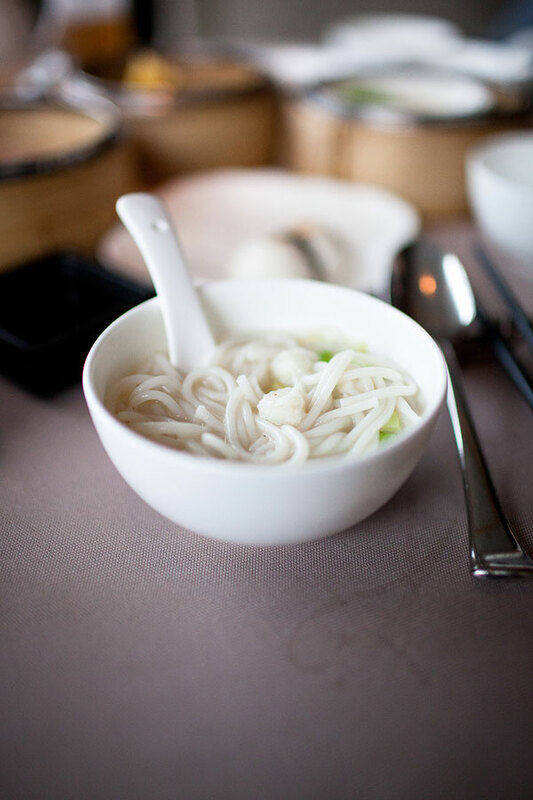 Before the dessert comes, we had a little Soup Noodle with Fish. 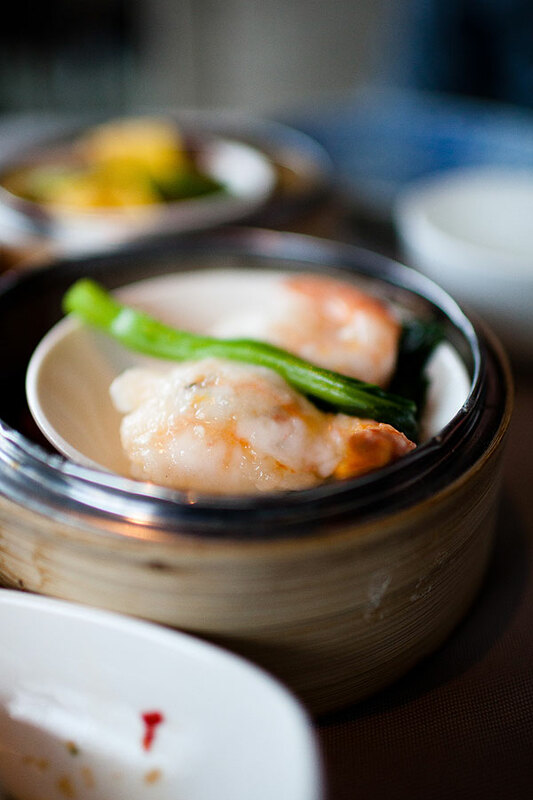 It is light and filling, perfect to be a finale while not stealing the spotlight on dimsum. Instead of the typical Hong Kong dessert like Red Bean Soup, we order something more traditional. 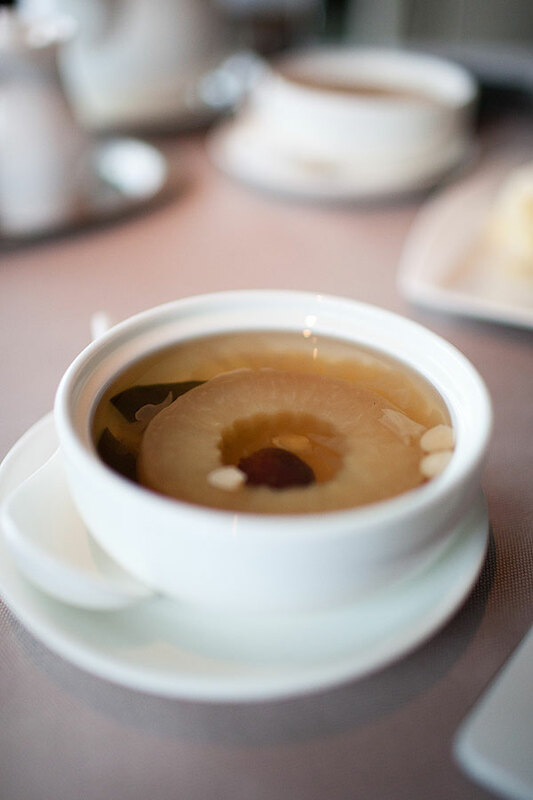 The Stewed Apple with Jujube and Snow Fungus 紅棗雪耳燉蘋果. I cannot believe they really put a whole slice of apple in the bowl! 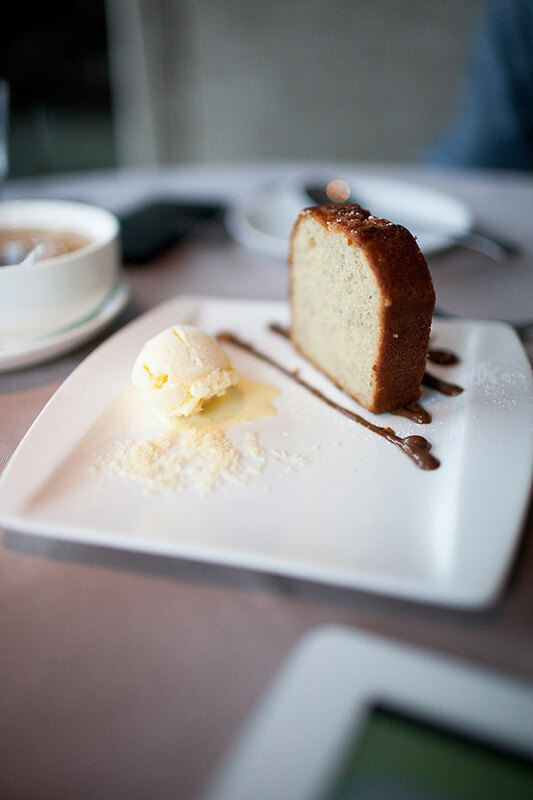 My friend probably tried to be special and ordered this Banana Cake with Vanilla Ice-cream. Maybe that is a perfect way to show how special Hong Kong is, which is city with merged cultures of east and west. The meal was definitely enjoyable. Everything was delicate and well thought of. 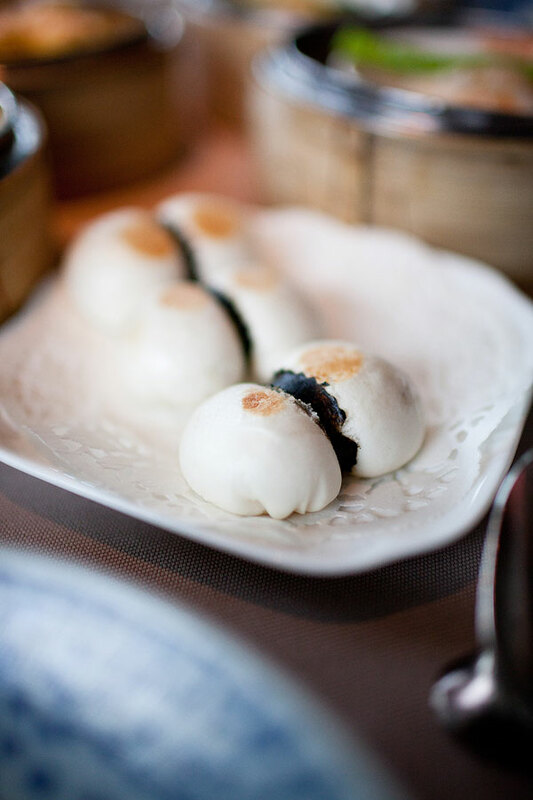 I am glad that while they are keeping the standard of dimsum at a high level, they also try to do something more creative like the wagyu buns. 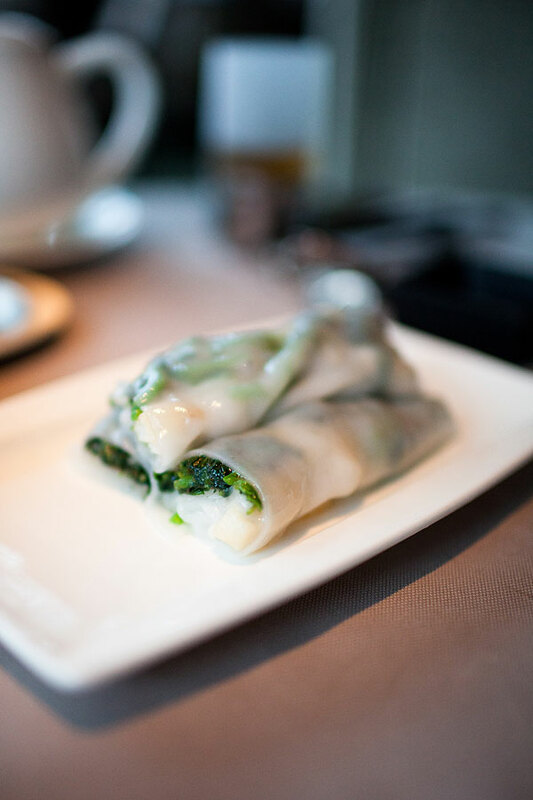 At the same time, they bring back some old dimsum and rare dishes (like the Beijing Dumplings). The only thing to complain is the service. As we are ordering, it takes long for the trainee waiters to realize our existence even that we are sitting in the center of the restaurant. Many of them have no idea about the old dimsum menu, revealing the lack of training in the team. Nevertheless, the soothing and quiet ambiance with the amazing harbour view forces us to complain no more, and to me, the slightly higher price is worth it.